I've been using Pinterest for a while now. I didn't realise it was an American site. To celebrate it launching in the UK, I thought I would share it with you. Have you heard of it? I'm sure you have, but just in case you haven't it's a pin board for collecting photos and graphics from around the web. It's a great place to save ideas and each of your visual pins links to the original post. As a food blogger, it's also a great place to promote your recipes. I've actually started to turn to it instead of google. Say I want a recipe for lime curd or I want to find out how to get wines stains out of fabric? I do a search and pin it! What if I want to make my own gift boxes or find a tutorial for a new up-do for my hair. I do a search and pin it! As you see I have a variety of boards, but as you would suspect most of them are food related. What boards you have is up to you. You could have a board about films, decorating, poetry, plumbing. Anything you like really. 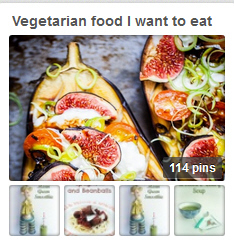 I'd like to invite you to join Pinterest, if you haven't already and follow my board Vegetarian food I want to eat. But one word of warning, Give yourself a time limit. It is seriously addictive and you can easily lose whole days on there. Now before I go, I would like to pin it forward and introduce you to another pinner. A wonderfully friendly blogger, you may already know. Choclette specialises in chocolate and she has some really scrummy boards to follow (which I do), as well as a wonderful blog. When you sign up, be sure to follow Choclette too! Thank you for the mention and kind words Jac. Your boards all look fabulous and another source of great vegetarian fare. I'm really pleased pinterest is getting a bit more of a UK focus too. Thanks Choclette, it is great fun, isn't it! I love pinterest but time does suddenly disappear when looking at pinterest - such an interesting way of sourcing information because it is so visual. What does it mean to have pinterest launched in the uk? It is just raising the profile of pinterest and pinners in the UK. It is very much an American site at the mo, even though it has international pinners.